In this next part of my series on fibery and crafty things in Paris, I'll tell you a little about the Musee de Moyen Age, better known as the Musee Cluny. I didn't visit here specifically for the textiles, but there sure were plenty! They have so many beautiful tapestries. The Musee de Cluny has a very large collection of medieval artifacts, including plenty of textiles. They currently have a room on Egyptian Coptic textiles, which was quite interesting. 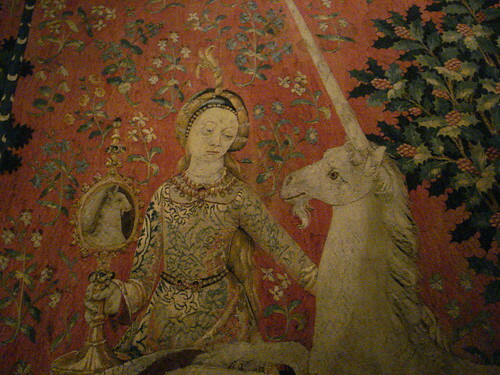 But what they're most famous for are the Lady & Unicorn tapestries. You've surely seen these before - they are some of the most famous medieval depictions of unicorns. These highly symbolic and somewhat enigmatic tapestries are huge, and beautiful, and most incredibly, have remained in a set of six for their entire history. They're woven from wool and silk, colored with plant-based dyes. It's incredible how well they've held up over the centuries. I was big into unicorns as a child, so you can imagine I was so thrilled to see these. They are more gorgeous in real life, and very large. 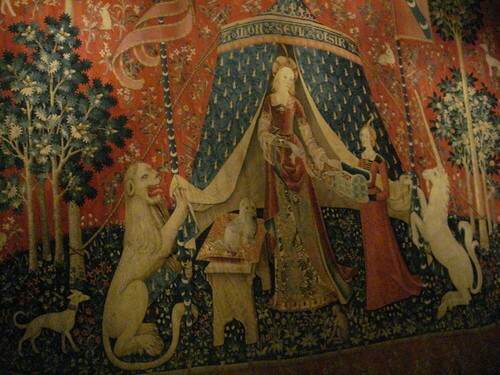 There are six tapestries, five representing the five senses, and one last one - 'A mon seul desir'. 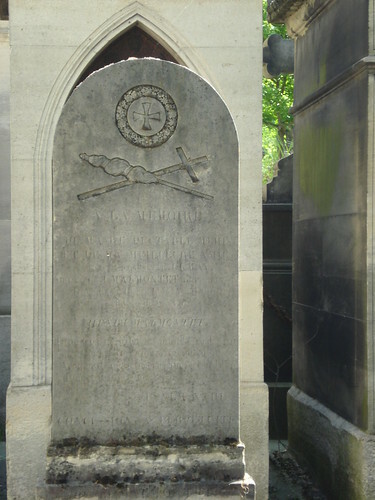 ...one more thing -- I found this headstone at Pere Lachaise cemetery. It appears to have a cross and a distaff adorning it. Anyone know what the distaff might symbolize - Mary perhaps?